According to numerous and persistent requests of one of our regular customers, LASERWAR specialists have worked on the feature, which will be an excellent addition to the musketoon. Ordinary hit sensors headband now has a real pirate bicorne hat! This is a real highlight for cosplay laser tag parties. Instead of traditional hit sensors headband, this pirate hat will be a perfect addition to the musketoon. 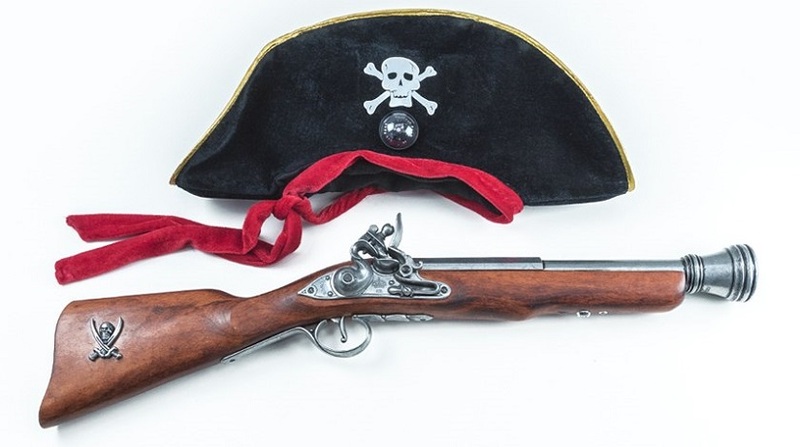 This pirate hat is comfortable, light, durable and unpretentious in care. It is perfectly suitable for both adults and children. The red ultrasoft fabric perimeter ribbon allows you to fix it on the player with any head circumference. The inner lining is made of natural linen, that’s why the bicorne is surprisingly comfortable to wear. The pirate emblem on the front side of the bicorne concisely completes a unique pirate look.